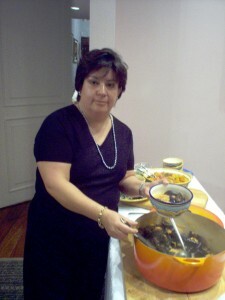 Since Maria Bolaños was a child, she was fascinated by food and cooking. A lot of her training came from the arduous work she did in her grandmother’s kitchen, assisting with banquets her father, a prominent oil digger, organized at home. Maria and her three sisters would help their mother put out lobster, lamb, tripe, caviar and more. Her childhood kitchen was bigger than Mother’s Bistro’s dining room, and Maria spent most of her days there between the Le Creuset casseroles, cast iron skillets, mortars and pestles. Most of her knowledge comes from her passion for food and the opportunities she’s had to travel and eat around the world. She went to culinary school at the Art Institute of Fort Lauderdale, and despite the advice of her first chef-instructor to “never ever, ever open a restaurant on your own,” that’s exactly what she did in Mexico City. She created a beautiful menu and a beautiful restaurant (Restaurante Sabina). On the eve of opening,the local government demanded that she have 70 parking spaces, which was absolutely impossible. She had to close her business and donated all her equipment to a convent. This setback was not enough to defeat her passion for cooking. She left her country because she could no longer trust a government without regulations, and has been a U.S. resident living in Portland for the last two years. Now she finds herself wanting to cook again, and in honor of Cinco de Mayo, we figured it would be a perfect time.